Mountain flying demands its own rules and an entirely different set of flying skills than flatland flying. The new Mountain Flying Bible Revised contains 100-percent new information. It is jam-packed with updated advice, lore, science, and wisdom. This edition contains 16 pages of color photos operating into some Idaho backcountry airstrips. This is your opportunity to acquire one of the most useful books for your library personally autographed by the author. Review of the Mountain Flying Bible – This book is one of those that all pilots can learn from (just as it deepened my understanding in many areas), and should be part of every serious pilot's reference library. It is, in all likelihood, the best aviation book written in recent years that focuses on light aircraft. Certainly it is the most useful. I recommend it without reservation. For more than 40 years pilots have relied on author and aviator Sparky Imeson's mountain flying expertise. 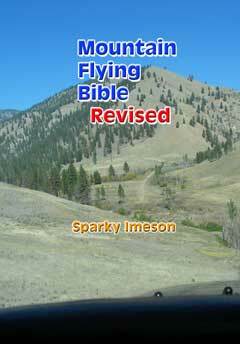 His Mountain Flying Bible Revised is the new comprehensive standard for mountain flying. Imeson's strength as a writer, teacher and mountain pilot lends a clear and concise style that is not only thorough, but fun and entertaining to read. All the hard-to-find information has been combined in one useful book. Loaded with helpful icons and photographs, it greatly simplifies, with clarity and authority, mountain flying operations. feet. Book dimensions: 5.5" x 8.5" x 0.85"
The book is laid out in the sequence of a typical flight, thus making information easy to locate when you need it. It covers preflight, takeoff, en route, arrival, and landing. Additional information includes aircraft and pilot considerations, preplanning, weather, weight and balance, the magnetic compass, airspeed indicator, altimeter, state aeronautics listings. Rules of thumb pertaining to each section are summarized at the end of each chapter. The appendix contains aeronautical information, formulas and a lesson plan for mountain flying lessons. Each section contains icons that serve as flags to draw your attention to meaningful, nice-to-know, need-to-know, advisory, precautionary and warning information. The photographs have simplified the understanding of various procedures making it easy to visualize explanations. The "Advanced" icon has been placed to serve as a warning that the procedure or maneuver should not be attempted by inexperienced pilots without first seeking instruction. The "Note" icon denotes information that you should know before flying in the mountains and you should, at the least, spend a moment reading the content. The "Remember" icon marks information that you will use over and over. It should be remembered to enhance the safety of flight. The "Rule of Thumb" icon points out procedures that save time and trouble. They are roughly correct, but not meant to be scientifically accurate, while promoting safety. The "Warning" icon represents a situation, event, or area that can get you into trouble (serious trouble) or cost you money (airplane damage), if you do not adhere to the recommendations. Stay out of Trouble – Learn the basic, intermediate and advanced techniques of mountain flying. The book is arranged in the sequence of an actual flight for ease of use in find the information you want and need. It covers Preflight, Take off, En route, Arrival, and Landing. Airplane Performance – Learn to anticipate how your airplane will perform in the mountains. Move into advanced operations with ease and safety. Discover simple rules-of-thumb to enhance safety and simplify operations. Weather – Learn the weather information required for peace of mind and increase flying pleasure. Color Photos – 16 pages of color photos of backcountry airstrips covering the approach, landing and takeoff procedures. Simplify your Flying – Comprehensive book with helpful Icons, Rules of Thumb, Formulas, and Secrets. Indispensable for the novice or experienced pilot. The Mountain Flying Bible Revised "has an excellent concept, format and presentation. It is one of the best how-to-do-it books around. All the hard-to-find and impossible-to-find information is combined into one useful book! It greatly simplifies mountain flying and enhances safety. Highly recommended." — Babette André, Publisher, Wings West magazine.